Ich hoffe, sie hat ihr gefallen. Lovely card, great embossing and gorgeous ribbon. The floral image is beautiful. 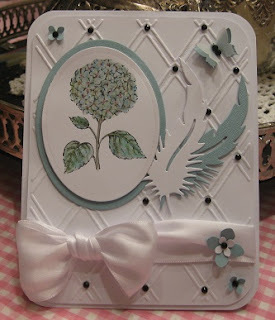 Lovely and elegant card!Thank for joining us at ScrapbookStampSociety Challenge.Hope to see again next week. this card is very elegant and the colours are fantastic.